Harbury Church of England Primary School. We provided funds for an exciting new display in a key communal area of the school. This is a large mosaic, on which every child in the school worked, showing the emblems of the four Houses to which pupils belong and the core values that the school aspires to instil. 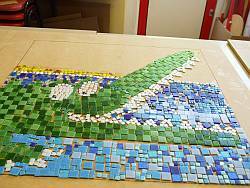 The mosaic was designed by the art Coordinator, Claire Payne, and uses brightly coloured tesserae in different finishes. The costs of the materials were very high and the school was able to use the grant of money to achieve a tremendous amount, thanks to the extra work that Claire was willing to do. It was difficult to predict exactly how many of each type of tile would be selected by each child and work had to be suspended briefly when supplies were exhausted until the new delivery arrived. 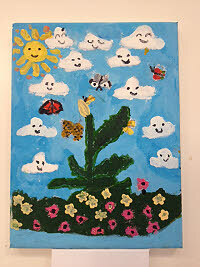 The finished work should brighten and inspire pupils for many years. 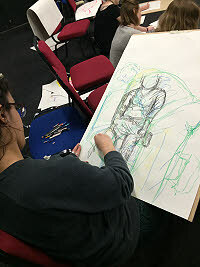 Our Society provided funds to support a series of Life Drawing workshops at Kenilworth school. These took place after normal school hours and were open to older pupils who were studying art and who contributed financially to participate. The art department were keen to offer this opportunity which is now sadly very rare. 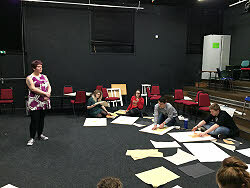 Jo Daly, the organising teacher, believed passionately that the ability to draw quickly from life is a basic building block of further artistic development and was pleased to have been able to find a sponsor to make the project possible. We supported children’s groups at the studios in Althorpe Street by providing money for additional equipment and mate rials. 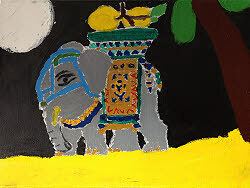 Two paintings by young artists were also chosen to be printed as postcards which are on sale to members. Our 2014 winner was James Reeves who also went on to Edinburgh, though to study fashion. We were exceptionally impressed by his work. Inspiration for his final show work came from an old family album of photos and memorabilia going back more than a century. He became fascinated by the idea of what is told or shown and what remains hidden; what shows through most strongly. Using images from photographs and ideas from his research, he decorated three coordinating pieces. 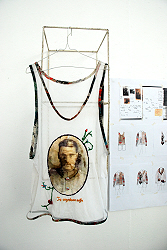 There was a vest, a shirt and an over waistcoat, all made of the same fine and semi transparent fabric. Not only was the thinking behind his work interesting, but also the skills in embroidery, photography and tailoring make him a most worth winner of our award. 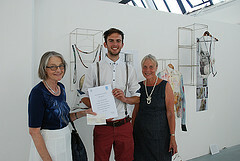 James Reeves receiving the RLSDFAS award. 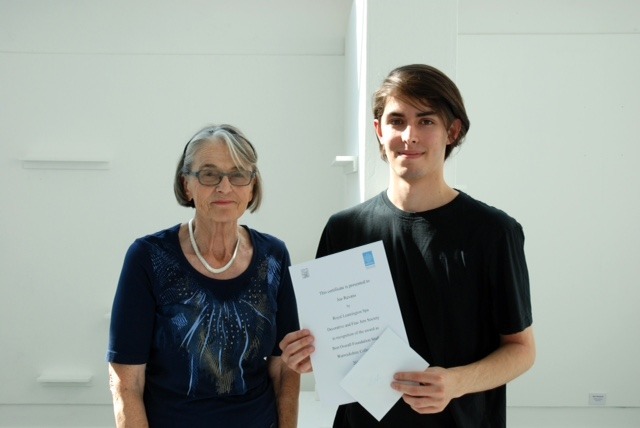 Our 2015 winner is Joe Revans, who is going on to Edinburgh to study Architecture. He specialised in 3D Design during his Foundation year. His portfolio was beautifully produced and contained many innovative ideas. His preoccupation is with form and function – his tools with overlong handles, making them amusing but difficult to use, made his point. 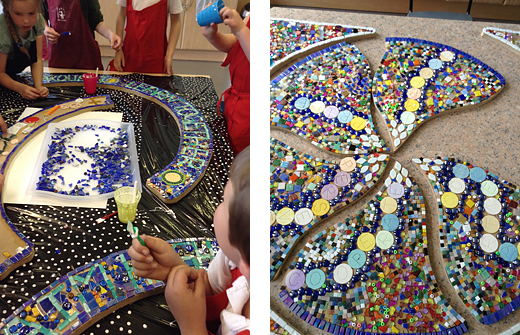 We recently awarded funds to this school to create a mosaic with local artist Helen Clues. The finished installation was created by all the pupils at the school and was based on the theme ‘Aiming High’. 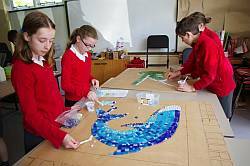 Key words representing the school’s ethos and aims were featured and a variety of different materials were used to complete the mosaic. Money was given to provide art for the outside area set aside for reflection. This garden itself was an example of partnership. 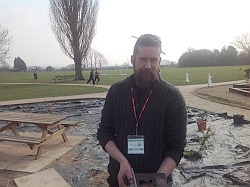 Jaguar Landrover provided the labour to clear the ground and the school paid for and organised the paving and seating. The choice of the central feature was for a globe sundial, decorated with organic metal shapes. 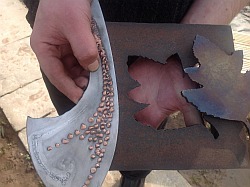 These are being designed by the pupils at the school, and then forged in metal by the artist in his Kineton workshop before being attached to the globe. 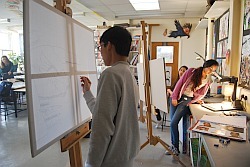 Our society provided funds for the purchase of easels and drawing boards. 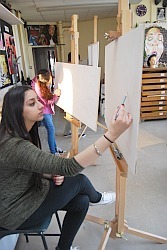 The school, which has an excellent record of achievement in Art, was keen to promote life drawing skills. The equipment will mostly be used by students taking the subject for GSCE and A level.